This Calar Alto image offers one of the best snapshots ever obtained of the spiral galaxy NGC 7331 in the Pegasus stellar system. It was produced with the camera LAICA attached to the 3.5 m telescope of Calar Alto Observatory. The warped disk of NGC 7331 shows its outstanding spiral structure shining behind a number of stars belonging to our Galaxy, and in front of a rich background populated by an overwhelming variety of distant galaxies. A good fraction of the field of view is occupied by a thin haze of the ghostly, fuzzy and dusty cloud-like nebulae known as galactic cirrus. Galactic cirrus are diffuse clouds made up from dust, complex organic molecules and gas. Normal reflection nebulae are strongly lighted by one or several close and hot stars, but galactic cirrus shine due to the reflection of faint and diffuse light coming from the Galaxy as a whole. These structures, better seen in the lower part of the image, have been caught thanks to the darkness of Calar Alto skies, to the quality of the instruments used and thanks to the complex and careful method applied to process the data. Vicent Peris, the astrophotographer of the Observatory of the University of Valencia and author of this image, explains that "good data and careful digital processing allow to assert that all diffuse traits in the image are real, with the only exception of the bluish halo around the brightest star". This image is outstanding first and foremost for the variety of objects that it contains. It will be a good challenge for astronomers to get the nature of each of these bodies, from point-like foreground stars to faint background galaxies, and to the intricate structure of the main galaxy. Good image processing should not benefit one kind of objects at the expense of others but, instead, it has to aim at an equilibrium. To reach this goal, the image of NGC 7331 has been processed using wavelet techniques, a mathematical procedure that allows the separation of structures present in the image according to their characteristic sizes, hence allowing an individual processing to each level. The final result significantly improves the original quality. That is why this image contains accurate representations of objects as different as the foreground nebulae (belonging, as all individual stars, to our own Galaxy) or the external haloes of small and big galaxies, and the internal structures of all of them. Colour is, also, a very important side of this photograph. The chromatic balance has been obtained assuming that all the light coming from the main galaxy, as a whole, is white. This reference allows to distinguish which parts of NGC 7331 are bluer or redder. This also makes possible to compare the hue of the main galaxy with that of its smaller neighbours and background objects. 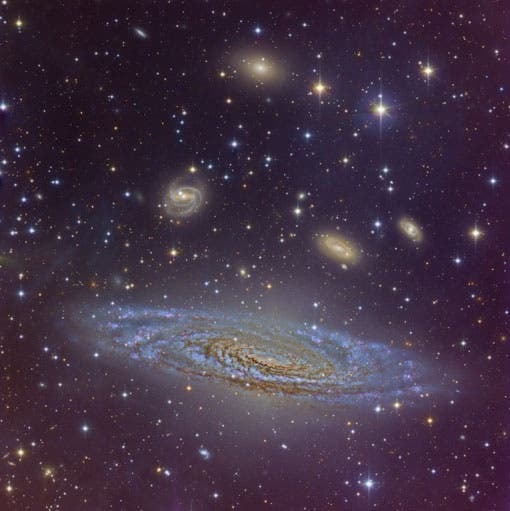 on the Calar Alto homepage (http://www.caha.es/ngc-7331-a-large-spiral-galaxy.html).